This is intended to be everything you could possibly want or need to know about our Christmas light display. The hope is that this information will inspire and aid you to create a light display of your own and help add a bit more wonder to an already wonderful time of year. We would also like to give a major shout out to Matt Johnson from San Antonio. His light show on YouTube inspired us to get into pixel lighting and gave us a standard of excellence and precision to strive for. He also has several how-to videos that were immensely helpful in understanding some of the parts required for putting together a legit Christmas light display. Below is an overview of our system showing how it is all hooked together, along with dedicated pages for each component. There are also other miscellaneous pages dedicated to specific issues we encountered and the lessons we learned from them. 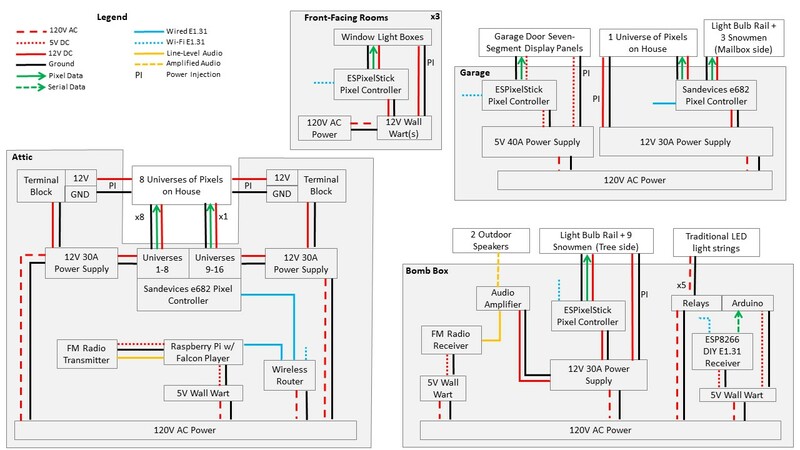 Our entire Christmas light setup in one “simple” diagram. As we laid out the system, we quickly determined that the attic was the most logical location to house most of our Christmas light electronics. While not the most convenient to access, it is the best option for shortening our cable runs and getting the best audio performance out of our FM transmitter, while also being 100% weatherproof. As an added benefit , we can mostly just leave the equipment there in the off season. Philip built a shelf for holding the electronics at the front of the attic right next to front-facing air vent through which we run all of our cables. One helpful thing we did was to wire in a power outlet right next to the shelf and put it on a light switch that lives in the laundry room (that’s where our attic access is). Having a switch in easy reach means we can hard reboot the system if needed without having to get a ladder and climb into the attic to cycle power there. The attic control center. We have tried several different placements for the FM transmitter but this one seems to be the best with the least amount of interference. We also have a mini control center in the front corner of the garage for controlling Universe 1 of pixels (the front of the garage) and the yard elements on the mailbox-side of the driveway. The mini control center in the garage. An Ethernet cable runs from the router in the attic to the pixel controller. Starting in 2018, we decided to run universes 6 and 7 from their own power supply and wireless pixel controller, primarily to avoid stringing multiple extension cords across the roof. These two universes are on the left side of the house and pretty far from the attic control center. Instead, we mounted a power supply and controller to the underside of the porch ceiling where it is protected from the elements. The front porch ceiling with its mounted equipment. We tried to be discrete with running the cables as well, and for the most part, they are well hidden from the street by the eaves and by the column. One of the unique features of our Christmas light display is the backlighting of our three front windows. Prior to 2017, we achieved this effect through the use of LED Par Cans. From 2017 on, we have used window light boxes to achieve the same effect but better. In 2017, we added 4 seven-segment displays to our garage door. These presented several interesting challenges due to the need for the garage door to remain operational. Our 2016 show was limited mostly to the house itself and thus was fairly two dimensional. In 2017, we introduced two new lighting elements in the yard to add a third dimension to our show: LED Snowmen along the sidewalk and Light Bulb Rails lining the driveway. The nerve center of our yard elements is our “bomb box”, so named because of all the flashing lights, clicking sounds, and wires contained within. It contains equipment for controlling our handful of traditional strings of Christmas lights as well as the audio speakers for the front yard. A good Christmas light show is not just about the technology. There is also a lot of creativity that goes into preparing the music and sequencing the lights. Our pre-2018 entire Christmas light setup in one “simple” diagram. This is here for reference to show how things have evolved over time.